The HP LaserJet MFP M436n is a monochrome multifunction printer with the ability to print, copy and scan up to A3. It would work well in a small office where the reliable nature of the printer and the streamlined operations will improve workplace efficiency. Print quality is good, while features such as good paper capacity, duplex printing, remote monitoring and high yield toners will improve the efficiency of the office. However, the printer is limited in what it can achieve and if colour printing or a fax function is required it may be necessary to purchase additional devices. Additionally, if your office carries out a lot of work on mobile devices printing can be awkward as there is no Wi-Fi connection. 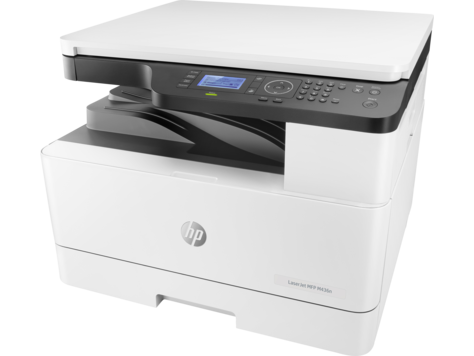 Measuring 560x540x413 mm and coming in an off-white design the HP LaserJet MFP M436n fits in well in most offices. A paper cassette holds 250 sheets and an input tray holds 100 sheets with the option of increasing paper capacity with an option 250 sheet tray. It is able to print at speeds of up to 23 pages per minute. The monthly duty cycle is 50,000 pages and print resolution is 600 dpi. The HP LaserJet MFP M436n is easy to set up with built-in Ethernet networking. It prints in duplex as standard and is able to print up to A3 size. Remote monitoring of the printer means it is easy to plan, manage and monitor printer tasks. High yield toner cartridges reduce the printer downtime. As there is no fax function on the HP M436n and it prints in monochrome only, this printer is limited in what it can achieve and it may be necessary to purchase further devices. There is no wireless capability, making it awkward to print from mobile devices.